For those days when you really need spoiling! At Audleys Wood Hotel we delight guests with our traditional afternoon tea in Hampshire. What better place to enjoy this fine tradition than in the grand drawing room of this historic country house. Gaze out the ceiling high windows whilst savouring each of our carefully prepared cakes, dainty sandwiches and the finest leaf tea, served to perfection. 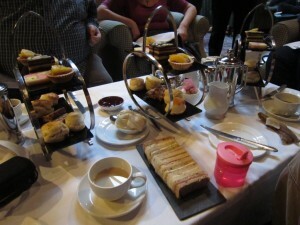 Full Afternoon Tea costs £15.50 per person and Cream Tea costs £8.50 per person. Upgrade to a Royal Afternoon Tea and enjoy a glass of Champagne for £24.50 per person. Located in the Manor House, The Library has been restored to its former glory as an elegant, beautifully appointed residents’ lounge. Decorated in warm earth tones, The Library boasts an abundance of lush armchairs, supple sofas and coffee tables for relaxation and luxury. Traditional afternoon tea, The Library’s speciality, is served daily from 3-5pm. Afternoon tea is served from 3.30pm until 5pm from Monday to Saturday and from 4.00pm – 5.00pm on Sundays. Afternoon Tea served between 2pm and 5pm, seven days a week, either on the Garden Terrace or in the Library. Afternoon tea is priced at £17.95 per adult and £8.95 for children. Full Afternoon Tea with a glass of Reynier Champagne £26.95 per person.